It seems like I've need a lot of sympathy cards of late so I decided to create several in the same design. 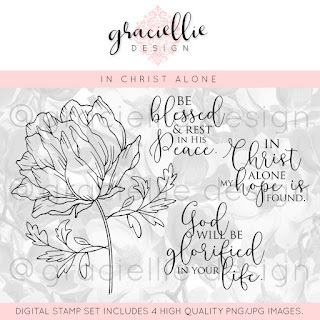 Graciellie Design's newly released "In Christ Alone" digital stamp set was perfect for this project. If you'd like to win this digital stamp set, check out the GIVEAWAY my team mate (Helen Gullet) is having on her Instagram page (ends February 18th). I cropped and printed the main floral image on watercolor paper. Next, I colored it in with Prismacolor pencils and used a colorless blender pen over the top. Last of all I added some highlights with watercolor markers and a white gel pen. For the butterfly I painted diluted distress inks (seedless preserves, mowed lawn, broken china) on watercolor paper before die cutting. For a little added texture and interest, I embossed some coredinations card stock and lightly sanded it with very fine sandpaper. 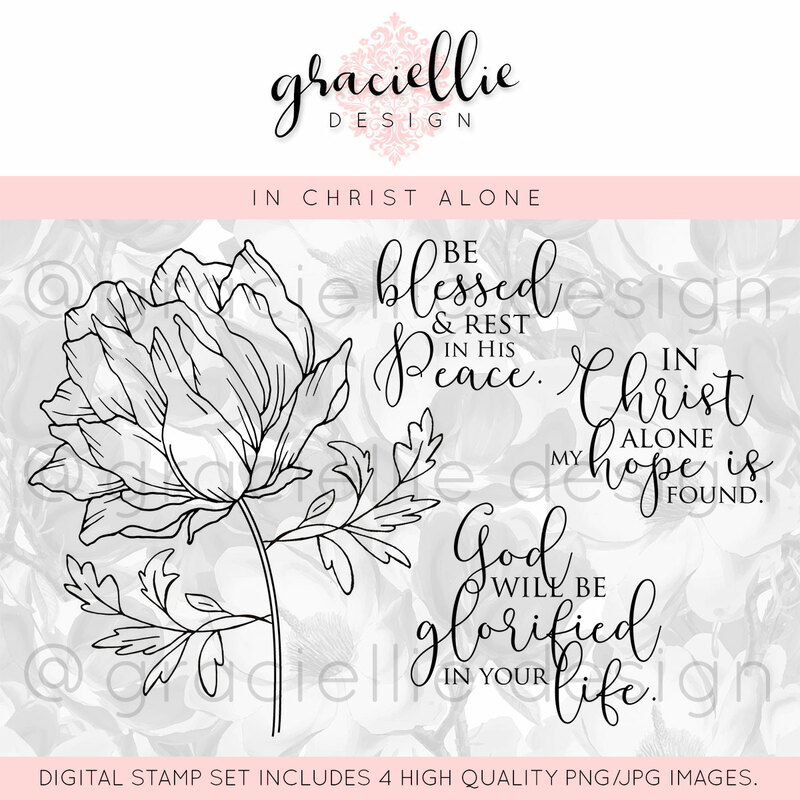 Be sure to stop by Graciellie's Etsy Shop and check out all the beautiful digita graphics, papers, and SVG files she's created! You won't be disappointed! Wow, I do love the distress inked paper you have used for die cutting the butterfly with .It really is pretty. Thankyou for coming and spinning the butterfly wheel again this week. Hugs Mrs A. Your card looks so pretty in the soft shades of lilac and the distressed background really sets it off, many thanks for joining in with our 'Flowers' theme at Stamping Sensations challenge. Love this digi image - and the butterfly is simply outstanding. What apretty sympathy card. This is beautiful, Esther! Such lovely restful colours, and a stunning butterfly and flower. Thank you for sharing it with us for our floral challenge at Stamping Sensations.